Earnie Stewart will no longer be Philadelphia Union’s sporting director. This afternoon, U.S. Soccer announced Stewart’s hiring as the first-ever general manager of the men’s national team, fulfilling a longtime ambition for Stewart while leaving the Union with a major vacancy to fill. His last day with the Union will be July 31, and he will assume his national team role on Aug. 1. He can now say that goal has been accomplished. As U.S. Soccer’s first-ever general manager, Stewart will oversee the technical side of the men’s national team and report to CEO Dan Flynn. The U.S.’s stunning failure to qualify for the 2018 World Cup led to the creation of the general manager position. The calamitous result led to both the firing of manager Bruce Arena and the decision of U.S. Soccer’s longtime president, Sunil Gulati, not to stand for reelection. The carnival-esque election that followed included status quo figures like Kathy Carter as well as wild-card personalities such as Eric Wynalda and Hope Solo. U.S.S.F. Chief Sport Development Officer Nico Romeijn told ESPN that a six-person technical committee chose Stewart from a broad group of candidates, ten of which were interviewed. It remains to be seen what the role will look like in practice. Romeijn indicated that the seven primary responsibilities of the general manager will be overseeing the technical side of the senior national team (including the implementation of a specific style of play), managing day-to-day operations, driving the team’s culture, assembling an integrated staff, (including some national team assistant coaches), using analytics, monitoring the U.S. player pool, and increasing and formalizing oversight. Notably absent from the list of duties is control of the youth national teams. “We think this is a big job, so asking someone to look at the national team but also overseeing all the youth teams, we don’t think [the general manager] could give the focus that we want,” Romeijn told ESPN. Stewart’s first task will be to help find the next national team manager — a task he hasn’t had to undertake with the Union. While Philadelphia head coach Jim Curtin predates Stewart at the club, Stewart has stuck with the incumbent and reaffirmed his confidence in the coach following a middling campaign in 2017. Stewart will not have sole hiring and firing power over the manager of the national team, however. Instead, Stewart will compile a shortlist of potential candidates and be a crucial part of any interview process, but the final decision will be made by the federation’s board of directors. That belief in a foundational philosophy stands out as the biggest reason Stewart got the job with the U.S.S.F. 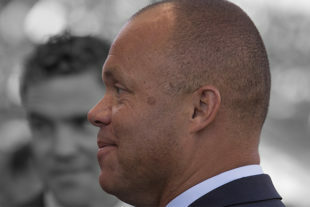 With the Union, as well as his stops in the Netherlands, Stewart implemented a clear top-down organizational vision and structure, including a progressive path connecting the Union’s U-12s all the way to the first team. The success of homegrown players like center backs Auston Trusty and Mark McKenzie with the Union this season suggest that Stewart’s philosophy is paying dividends. With a talented group of teenagers on the verge of becoming first-team fixtures for the U.S., Stewart seems like a wise choice to lead their growth. It remains to be seen whether Stewart will attempt to mold the youth national teams in a similar fashion, even though their control is outside his job description. Stewart can also lend his voice to the debate over dual-nationals through first-hand experience. Born in the Netherlands to a U.S. serviceman and a Dutch mother, Stewart grew up overseas and first plied his trade as a midfielder in the Dutch First Division before joining Eredivisie side Willem II in 1990. The move to the Dutch top league coincided with Stewart’s first of 101 appearances for the U.S. national team. For the Stars and Stripes, he is one of only five players to play in three World Cups, including the U.S.’s quarterfinals run in 2002. Despite a move to D.C. United in 2003, Stewart ended his playing career with the same club it began — VVV-Venlo. His 111 goals scored outside of the U.S. at the club level are more than any other American has managed. The return to the Netherlands helped pave the way for the next phase of his career and eventually led to his job with the Union. Following his retirement as a player in 2004, Stewart was announced as the technical director of VVV-Venlo in 2005. He quickly climbed the professional ladder, taking the same role the following year with NAC Breda in the Eredivisie. Four years later, AZ Alkmaar appointed Stewart as director of football affairs. On Oct. 26, 2015, Stewart was officially announced as the Union’s sporting director. “Earnie is our leader,” said Curtin last week after reports surfaced of Stewart’s imminent departure. Now, the Union have to find a new leader. So much for the 5 year commitment. At least he’ll be here for part of the summer transfer window. Wonder if he hires Curtin for USMNT coach? I am sure the Union were well compensated for thier loss. Zero accountability for his 5yr commitment. Was also not mentioned in Sugarman’s letter of today. I mean most of his legacy should still be in place for a long time. We aren’t going to hire a new GM who wants to disown BFSC, and stop using the YSC Academy, are we? If anyone at PSP is in touch with Eli please relay this message to him: I told you so. Nope, we all agreed to not relay your message to him so he’ll never know. A technicality, but Arena was not fired – he resigned. More BS from ownership. I’m fine with Earnie going. Not happy with Sugarman staying. The Union’s web page also has interviews with both Sugarman and Graham. Both interviews are conducted by former PSP expert Adam Cann. Few things: I like Graham. I want him to buy out Sugarman. I like what he said about hunting all over to find a replacement. Another thing: I also learned, it’s pronounced “can” – like a beer can… and not like the actor’s last name – James Cann. Hmm… been pronouncing it wrong in my head all these years. Learn something new everyday. Good luck to Earnie. I think we are all better off after this move. He had a vision philosophy and plan to leverage the Union for his dream job and twiddle his thumbs and be local enough for interviews. It worked. On one hand I’m happy for the guy who seemed to kind of reset the organization after it really was a total mess. And I think he can be successful with the USMNT. On the other I’m pissed off he’s leaving without seeing this through. He started this and he won’t finish it. And when left to their own devices the Union brass (ie: Sugarman) don’t always make the best decisions. I said this, as others did, when the announcement first came out he was on the short list: it’s all about what happens next. Please hire someone with credentials, who has worked in this league, preferribly from outside the organization, and give them the chance to really and truly lead the team as they see fit. Ali Curtis. Ali Curtis. Ali Curtis. Ali Curtis. Ali Curtis. And one for the owners up top. Ernie’s impact won’t necessarily be felt by his signings, even if we get that DP striker every Union fan has been dreaming of since day one, before he leaves. Where his impact will be felt is in the culture of the Union. Whether or not we accept it, things changed when Stewart got here, and so did the Union. That good old VPP was truly implemented, not just in the first team, but all the way down to the academy. As much as we’ve hated it, the 4-2-3-1 has also become a part. Two a day practices. Play the kids is becoming a part. Wearing suits to matches. There are probably countless other things we don’t even know about that Stewart has touched, changed, molded. Five, ten, fifteen, twenty years down the line, when this grand experiment finally comes to fruition and that first silverware is hoisted, it will have been because of Stewart’s groundwork that such a thing was made possible. I think he deserves more of our respect than we realize. I just get that feeling. I break balls… but I agree with this. ES made us better than we were. Maybe not MLS Cup better, but overall, better. Um, Earnie having made us better than we were, considering the utter hash left by Nick Sackiewicz, was not exactly a high bar. So, next US Soccer will say “Earnie made us better than we were” because we’ll actually make the World Cup in 2022? Um, great?? All indications point to the Union being a total circus before Stewart got here. Yes, we all know things were in the pipeline, but who here had ever connected those pipes to the main hub. Imagine you join a shipping business. It has a CEO, a Warehouse manager, a couple of foremen, some workers, and someone to answer a phone. There’s no infrastructure. There’s no one to sell your business. There’s no documentation on how to do things the “ABC” shipping company way from CEO on down to the floor cleaner, which you don’t have yet. There’s no conveyor belt and sorting system to make it easier to get the right packages on the right trucks. The atmosphere at the workplace is one of a college frat, not a professional business. Memos get sent but there’s no follow up, or even finishing of some jobs. The workers load trucks by hand instead of using fork lifts. Now you come in and it’s your job to turn this mom and pop business into something that looks like UPS or FEDEX. This is what I believe Stewart has done. I think things used to get done or continued to run without the wheels completely falling off, by the sheer will of the people involved, not because there was a plan and vision and a framework to work from. Sure things got better when Novak left and Hack took over and had some vision. But no one knew how to make it all run well, make it work. I think the Union were a bigger joke of an organization than we realize before Stewart. Almost scarily so. Maybe I’m wrong. Maybe I’m giving him too much credit. But i really don’t think so. The scope of this project was way larger than just the footy side of things.